Rasher: "Our scorecard is the number of new jobs created, the amount of new investment, the amount of new economic revitalization. It can't happen overnight, but we're starting to see results." DETROIT -- Bruce Rasher runs the third-largest portfolio of industrial property in the United States, but with holdings made up of unwanted plants that General Motors Co. got rid of during its 2009 bankruptcy, he will need a great deal of patience to sell them all. The redevelopment director of the Racer Trust and his team were charged with selling 89 former GM buildings in 14 states, using $770 million in federal funding for environmental cleanup and upkeep. However, getting top dollar is not the only requirement: the former real estate executive and small-town Michigan mayor is also charged with creating jobs. "Our scorecard is the number of new jobs created, the amount of new investment, the amount of new economic revitalization," Rasher said in an interview. "It can't happen overnight, but we're starting to see results." He was speaking ahead of a marketing event this week at the trust's headquarters in the cavernous Willow Run plant, where GM once made transmissions. The trust, officially known as the Revitalizing Auto Communities Environmental Response Trust, was created in March 2011 under a plan drafted by the U.S. Bankruptcy Court in New York with the mandate to sell the plants GM left behind following its bankruptcy and $50 billion taxpayer bailout. GM is now strongly profitable, thanks partly to shedding those properties and other unwanted legacy costs. The trust is tasked not only with simply selling its 44 million square feet of industrial space, but creating jobs and increasing tax revenue in communities where the plants often were a central part of life. It also must fund environmental cleanup at the sites and take into account community redevelopment desires, while also weighing the credibility of potential buyers. "If it's going to throw off potentially a higher number of jobs, then we will accept a lower purchase price," said Rasher, 57, who joined the trust last summer from the world's largest real estate services firm, C.B. Richard Ellis, where he managed its North American manufacturing and brownfield practices. A brownfield property is an industrial or commercial site that is idle or underused because of real or perceived environmental pollution. Rasher's job requires him to juggle the desires of corporate buyers and local government leaders with the dictates of the federal government, requiring him to tap into his prior experience as a two-term mayor of tiny Marshall, Michigan, as well as his environmental management duties at a unit of utility CMS Energy. He leads a staff of 30, keeping the empty plants in shape in the hope companies will reopen them. Rasher urges patience to get the plants sold, especially for larger buildings like the 5 million-square-foot Willow Run plant. 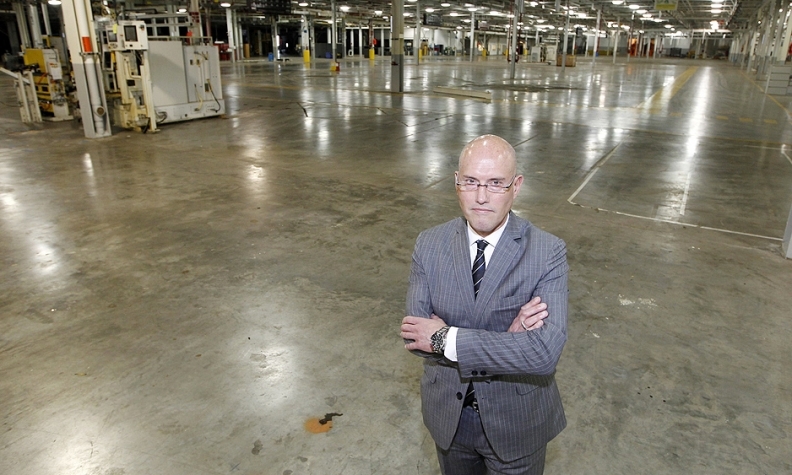 "It's not unusual for our buildings that are over 1 million square feet to be on the market anywhere from 750 to 1,000 days," he said, pointing to Ford Motor Co'sWixom, Mich., plant that has not been sold since it was idled by GM's smaller rival in 2007. So far, Racer Trust has sold a little more than a quarter of the properties -- about 12 million square feet -- and has another deal under contract that should close in the next two months, Rasher said. More deals are close as the U.S. economy has improved and brought interested buyers out to kick the tires. "A lot of the Class A manufacturing buildings have been picked over, so our properties have now become much more attractive to the market," Rasher said. "My phone has been ringing off the hook," he said, noting he followed up on 160 leads last year, a number he easily passed in May. While the trust must satisfy its requirement to try to create jobs, Rasher points to advantages, including federal backing on environmental cleanup at the sites and the support of local communities. A 69-acre site in Muncie, Ind., has caught the eye of a commercial aquaponics start-up that hopes to employ up to 400 people, initially earning $12 to $16 an hour, raising fish and growing fruits and vegetables. "We target brownfields because we don't do anything below ground," Glynn Barber, chief executive of Indianapolis-based Victus De'Aqua, said at the marketing event. "You go into any community across the country and they have empty brownfield sites. We'd like to do something positive for the sites, have a work force by that community." Willow Run -- where the marketing event was attended by several hundred local government officials, developers and corporate executives -- may take longer to sell because of its size, but access to the adjacent airport makes Rasher hopeful. "A building that size is a marathon," he said, pointing to its advantages as well as its history. "That's where Rosie the Riveter worked. They were pushing out one bomber an hour. It was truly part of the arsenal of Democracy." Rosie the Riveter is an iconic figure in U.S. history representing American women who worked in factories during the Second World War, including the Willow Run plant that built B-24 and B-29 bombers. Rasher's optimism is shared by his staff, many of whom work in plants where they were once employed by GM. "My hope for here is for Racer to bring in jobs," said Mike O'Byrne, the trust's site manager at a former GM powertrain plant in Fredericksburg, Virginia, where he worked for more than 30 years before taking a buyout in 2009. "I'd like to see the people that I worked with, their grandchildren, working here," he added, pointing to a picture of the 300,000-square-foot building on display for potential buyers to view. However, getting top dollar is not the only requirement: the former real estate executive and small-town Michigan mayor is also charged with creating jobs. The trust is tasked not only with simply selling its 44 million square feet of industrial space, but creating jobs and increasing tax revenue in communities where the plants often were a central part of life. It also must fund environmental cleanup at the sites and take into account community redevelopment desires, while also weighing the credibility of potential buyers. Rasher's job requires him to juggle the desires of corporate buyers and local government leaders with the dictates of the federal government, requiring him to tap into his prior experience as a two-term mayor of tiny Marshall, Michigan, as well as his environmental management duties at a unit of utility CMS Energy. He leads a staff of 30, keeping the empty plants in shape in the hope companies will reopen them. "It's not unusual for our buildings that are over 1 million square feet to be on the market anywhere from 750 to 1,000 days," he said, pointing to Ford Motor Co.'s Wixom, Mich., plant that has not been sold since it was idled by GM's smaller rival in 2007.